True romance is in gestures. 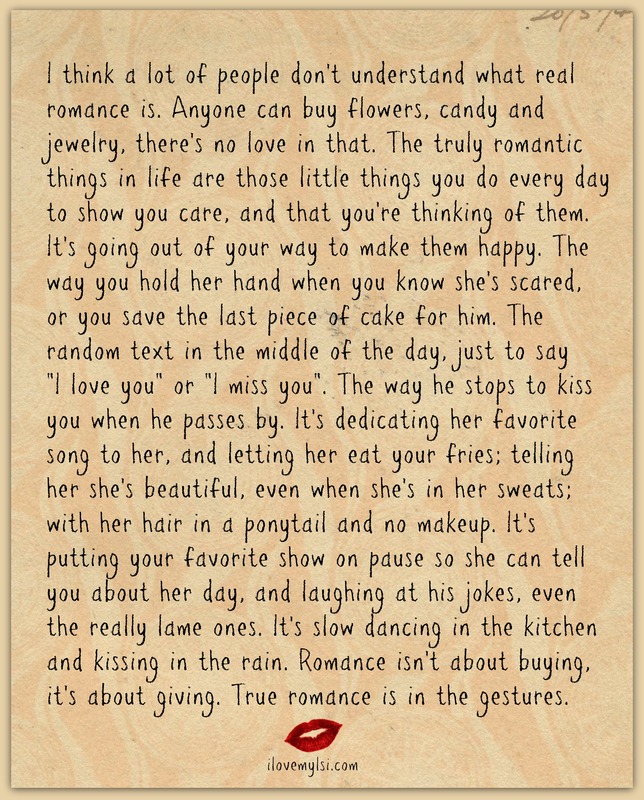 I think a lot of people don’t understand what real romance is. Anyone can buy flowers, candy and jewelry, there’s no love in that. The truly romantic things in life are those little things you do every day to show you care, and that you’re thinking of them. It’s going out of your way to make them happy. The way you hold her hand when you know she’s scared, or you save the last piece of cake for him. The random text in the middle of the day, just to say “I love you” or “I miss you”. The way he stops to kiss you when he passes by. It’s dedicating her favorite song to her, and letting her eat your fries; telling her she’s beautiful, even when she’s in her sweats; with her hair in a ponytail and no makeup. It’s putting your favorite show on pause so she can tell you about her day, and laughing at his jokes, even the really lame ones. It’s slow dancing in the kitchen and kissing in the rain. Romance isn’t about buying, it’s about giving. True romance is in gestures. I knew when love had finally arrived. It feels amazing to be touched by the person who understands your mind. I love your comments! and your site!